As you may know, I love Eric Clapton. His guitar style, both electric and acoustic, has resonated with me since I first picked up a guitar at age 13 (I’m 38 now). My friend is an avid collector of reissued guitars and amps. He’s a man of means, and probably has a couple hundred thousand dollars worth of custom shop gear. Each week we have a two hour lesson where I get to play through guitars and amps — that others can only dream about. Lately, his two best sounding pieces (to us) are the Eric Clapton Blackie Strat, through a Fender Super-Sonic combo amp. 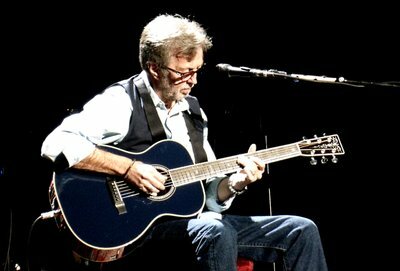 Interestingly, the Blackie (that is available to the public for around $1500) is the same one Eric Clapton plays live. He has given away all of his actual vintage gear to his charity, the Crossroads Center, a drug and alcohol rehab facility in Antigua that he co-founded in 1998. Intellimusica is focused on acoustic playing, because I’m typically doing arrangements of other songs. Also, most people have acoustics as the’re generally a more accessible instrument. However, the collection of Clapton-esque licks in the video above would sound great on an electric guitar too. I lifted some of these licks from a recent Clapton performance, and I’m surprised at how much he still uses the basic pentatonic/blues scale. As blues guitar players progress they tend to pull away from it, into other positions on the neck that allow for some more obscure blues licks. To know what I’m talking about, check out my Loose Acoustic Blues in the key of A. I move all around the key of A, useing blues positions all over the neck. It’s a free tab too, and it might be wise to start there as this riff is more difficult to play. I chose the key of C, because it’s not widely used. It’s important for guitar players to broaden their blues playing beyond the typical blues keys of E and A. Although, this riff is only 35 seconds long, it should be considered for intermediate guitar players (and up). The guitar tab is one and a half pages long, and I’ve done my best to section off the licks to make it easier to comprehend. Note that a / symbol means to slide up, and the \ symbol means to slide down. I’ve favoring alternate picking through most of the fast runs — rather than hammer-ons and pull-offs. I would encourage you to use this as the perfect excuse to work on your pick speed — and not insert hammer-ons and pull-offs to make it easier.